The sight of healthy, shining black buffalo dressed colourfully and racing through slush fields can stun any onlooker. We are referring to the traditional festival of Kambala that has existed in the region of Karnataka for several hundred years. It is primarily a tradition followed in the coastal region of the state; key centres being villages in and around Mangalore and Udupi. The annual event sees anything between 20 to over 40 such races. Each village has its own speciality and uniqueness in the Kambala festival. There has been much talk about the festival in recent times with the supreme court banning the race as an act of cruelty to animals. However, races continue to take place with stringent regulations in place. The future of the Kambala Buffalo race definitely looks uncertain. However, for those of you wishing to experience this in person, here is what you need to know. Take a look at the ten facts about the Kambala Buffalo Race. There are multiple versions to the history of Kambala, while some believe that the kings of more than 1,000 years back started this tradition as a royal pastime, others believe that the farmer community started the tradition. The traditional Kambala festival was considered a thanksgiving gesture to the gods for a good harvest or rain. Some even say it is in thanks to the higher powers for protecting their animals against diseases. It was initally organised primarily by the kings and landlords in the various villages. What is the Kambala Buffalo Race? 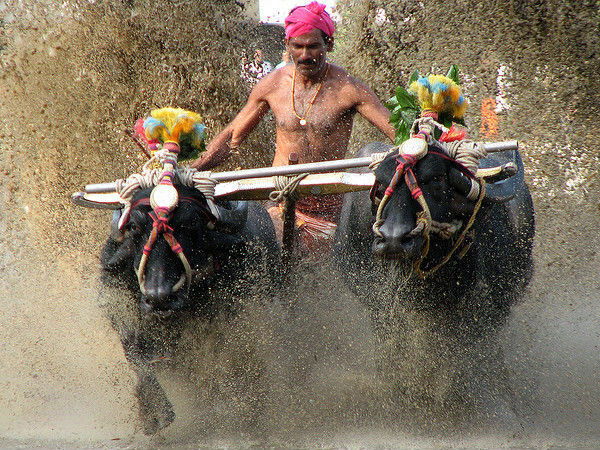 The traditional Kambala is a non-competitive sport, where the buffalos are made to run one after another through the fields of slush. However, the tradition evolved into a rural sport that pits buffalo teams against each other to race in what is one of the most rustic and spectacular settings in India. Both competitive and non-competetive Kambalas take place through the year and you can look through the official calendar and decide on what to witness. The race is a big event in this part of the country and more than big money is at stake; villagers consider it a mark of pride and prestige to have their buffalos win. The Kambala takes place typically from November to March. It is conducted in different part of Udupi, Managalore and the surrounding region across different dates between November to March. So it is not one single event but many races and events the collectively forms the modern day Kambala. Actual dates are released by officials and is best checked with the local communities before planning travel. The Kambala Buffalo race and festival takes place in coastal Karnataka or the South Canara region. Two popular regions where the villages take part in Kambala festivities are Mangalore and Udupi. Popular villages taking part in the Kambala include; Kadri, Pilikula, Vandaru, Moodubidre, Gulvadi, etc. The event name usually is the village name followed by Kambala, such as the popular Kadri Kambala. The setting for the festival is any local paddy field with suffecient water available. Buffalos are stars of the event, all eyes are on them! These buffalos are specially trained and fed in preparation for the event. The seniority of the buffalo is based on its age. Buffalos are the farmers' best friend and good care is taken to ensure their wellbeing before and after the race. In fact, the winning team of buffalos are pampered silly! Can you beleive these buffalos even receive special massages to help them cope with the aggresive demands of the sport. These men are not taking part in internation, national or even district level athletic competitions but that does not mean they are not equally talented as such players. Imagine the sheer stamina and strength required to race with buffalos at blurring speeds! It is not hard to differentiate them in a crowd, with their athletic build and focussed eyes. The runners are also trained and prepared for the event. They are paid well and star runners are much in demand. There are multiple formats of Kambala races and various categories in which teams compete. Each have different prizes that include cash rewards and other gifts. The grand finale event will see the closing ceremony with important dignataries and the main trophy will be awarded. The teams look forward to winning for more than the cash reward, s it is also about pride and the immense effort that is put into participating in the event. In 2014, many animal activists protested against the Kambala buffalo race, condemning it as an act of cruelty against animals. The laidback water buffalos are not built to race so aggressively is their arguement. The supreme court even sent out a ruling in November 2014 banning the race. However, recent news suggest that the Kambala Buffalo Race is set to take place in parts of Karnataka with stringent rules in place, including buffalos without riders not being allowed to race and video cameras shooting the entire incident to ensure no harm is brough to the animal. Kambala in 2015 is scheduled to take place in parts of coastal Karnataka across the months of January, February and March. Tentative dates for the event in January 2015 include Adve-Namdikooru on the 3rd, Miyaruv, Lava Kusha on the 10th , Moodubidire on the 17th , Ikala Bava, Kanthabare Budhabare on the 24th and Katapadi, Moodu Padu on the 31st. Dates have to be confirmed with the local authorities to ensure there are no last minute changes. People interested in rural traditions, culture, sports and those passionate about photography should definitely visit the Kambala festival. The essence of the festival is nicely summed in a popular quote on Kambala "Hold your breath. Silence rules the air as thousands watch in stunned anticipation! The man is crouching behind the buffaloes on a slive of wood attached to the animals. Not a muscle moves. Only the wind is playing on his lock of hair. For him the race is all that matters. Suddenly the scene explodes, the man springs up, his hand cocked, his whip held high and the huge animals lunge forward, bellowing, their hooves churning the muddy waters and sending their wet spray in the hot air, their eyes wide, wild and white - man and beast engaged in one spurt of activity and one aim - victory."